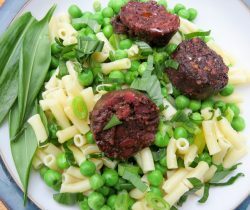 The days are warming up, perfect for this fresh Spring pasta with Vegan Black Pudding. Quick and easy to make and ready in 10 minutes. Check out Our Lizzy’s page to see what they are all about. Cook the pasta for 7-10 minutes according to the instructions on the packet. Cook the peas, chop the spring onion. Combine with the drained pasta. Season well and keep dish warm. Heat some olive oil in a small frying pan. When the oil is hot, add some chopped V Pud and cook on both sides. Add to the pasta. Tear the wild garlic leaves and add before serving.